Update 1:00 PM EDT: Hall of Explorers is now live in the Americas. The fourth and final wing of The League of Explorers, Hearthstone's third Adventure, launches tomorrow (Thursday, Friday in EU) and although we don't know the exact release time of it, we can certainly check out what we're going to be up against! If you don't want to be spoiled, don't read on! The information below on the third wing bosses can be helpful in the creation of decks to combat them quickly if you're aiming to beat all your friends, and the ladder, to the new cards. Twelve! That's the number of cards we'll be seeing from this week's wing, Hall of Explorers. All this week's cards, and their sources, can be found below. Each fight has different specific cards assigned to them. Unfortunately, we won't know all the details going in, but at least you can get a glimpse of some of the mechanics we'll be playing against for each fight to help tune your initial decks. What a wonderful museum. Here, meet my new friend, Skelesaurus Hex! This fight is a bit of a mystery. All we can assume is that it was a dinosaur at one point. Oh, and randomness. Lot's of randomness. Such lovely toys. A shame you keep breaking them. Sigh. Another encounter we don't really know anything about other than his Hero Power. Fortunately, for this fight, it actually says quite a bit about it though so let's take a look at that! 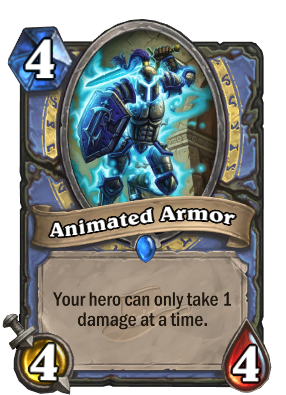 You can't deal more than 1 damage to him on each attack, this sadly includes attacking his minions on heroic. 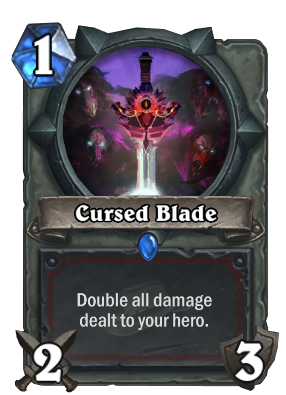 One Attack minions / weapons are likely to be some of the most value in the game, since you aren't spending mana for an attack stat that is irrelevant. Dreadsteed could see some pretty good value here. Mogu'shan Warden.. possibly. 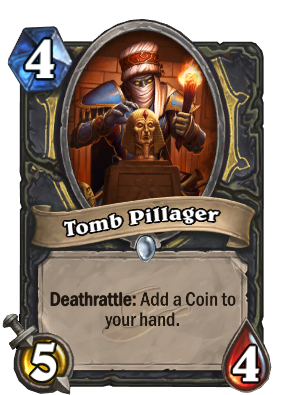 Really depends on his deck composition, but it could make quite a few trades! Baron Rivendare + Unstable Ghoul? That jerk who's been taunting us this whole time? That's this dude. 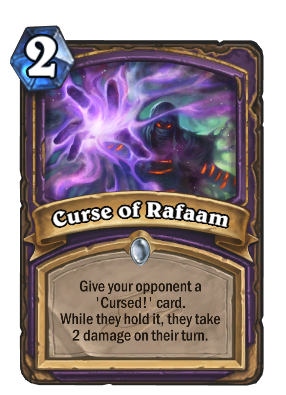 He has a hero power which works just like Unstable Portal, costing the same 2 mana on Normal, or 0 on Heroic. His special card, Boneraptor, steals your weapon. Hilariously, if you read into the dialog for this fight in the client.. he appears to steal your deck. Time to build the shittiest deck ever - or is it? I like your deck. I think I will take it! Oh yes this hand of cards is incredible! Is this deck ALL golden? Your collection rivals my own! Magma Rager? Why would you play this card? Perhaps I have made a mistake taking your deck. Your deck is amazing! Ahahahaha! Your deck is garbage, time to use my own. Enough! You are nothing before the Staff of Origination! We've gone and made him angry, and now we get into a somewhat complicated encounter which seems like it could go a couple of different ways. One way, we can assume that this is going to be a heavily orchestrated encounter where Rafaam throws the other bosses into the field, and you're needing to take them down while he draws random artifacts through Rummage. This makes sense assuming that we now hold the Staff of Origination hero power. Or, the inverse could be true. 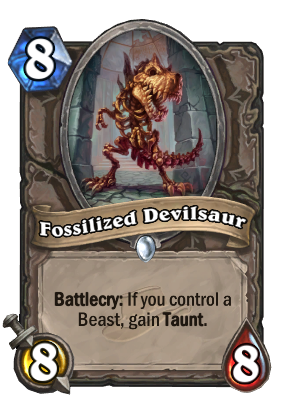 Perhaps you're the one trying to destroy this madman now that he's taken your deck, much like the Mine Cart and Temple Escape encounters. You're picking up random artifacts each turn to throw his way to defeat the bosses hes throwing in front of you and he's attempting to charge the staff one final time to finish you off. Really, there's a lot going on with the cards in this encounter, and it's best that we just present them. Be ready for anything, this boss fight looks promising. Staff of Origination is the Heroic version of the staff. Eek. Our special Winter Unveiling card design competition, in partnership with MyMiniFactory.com and their awesome community designers, is almost over - but first we need your help! We've taken over 500 submissions down to the top 30 and you need to help us choose the winner who will be going home with a custom 3D-printed Hearthstone card of their creation. How can you help? Super easy! Head on over to our finalist thread to check out the finalists and vote for the ones in our poll you think are deserving of grand champion status! So what are you waiting for? Go vote for your favourites and we'll announce the winners once the competition has concluded. Good luck to all our finalists! Verry disapointed in rafam as a final boss...nefarian or KT were a lot better . I easily killed Rafaam by building a unusable deck with all my 8+ cost cards, which he could not play until turn 8. 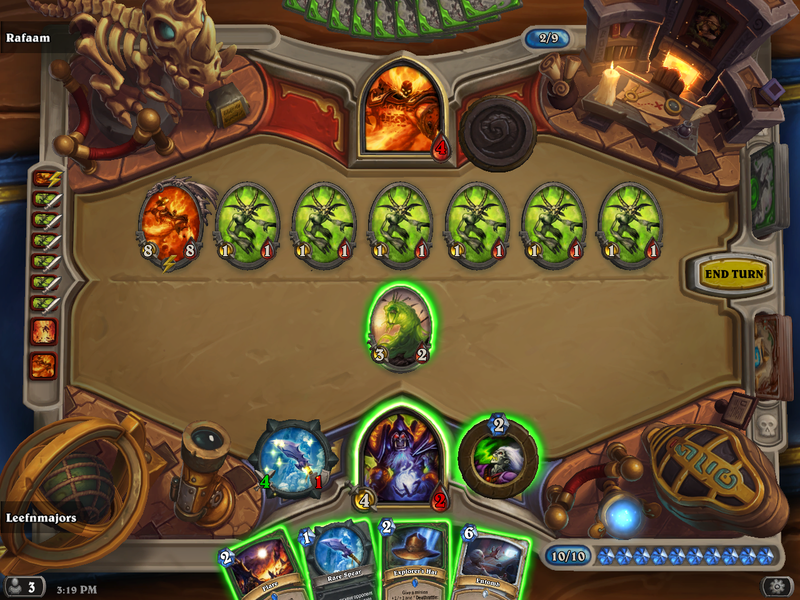 I controlled the board agaist his Unstable Portal minions while damaging his face at the same time. I won on turn 9, 1st try. Just wanted to mention, there's a horrible bug with the Crown of Kael'thas and Malygos on the Rafaam Unleashed fight. Instead of buffing the amount of times it would hit by 5, it increases the damage of EACH HIT by 5, resulting in a whopping 60 total damage. Was hilarious... until it killed me from full HP. Live in EU as of 4 minutes ago! I beat Arch-Thief Rafaam in heroic by building a self fatigue deck. That was crazy fun. The Mage Hero Challenge deck is really irritating. Stupid amounts of high cost and high attack cards. I actually beat Rafaam with the crap deck on Normal. This fight is incredibly random with the portals. Also, Rag-ception. 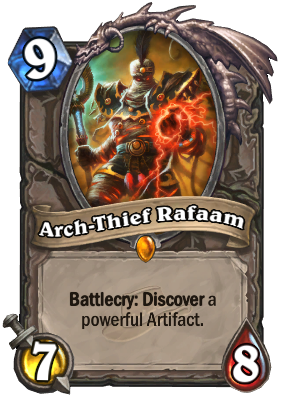 Arch-Thief Rafaam is . . . RNGtastic a bit. 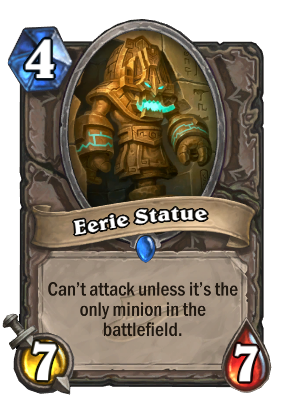 He does steal your deck right away, and plays cards from it, plus his Unstable Portal hero power and his special card. 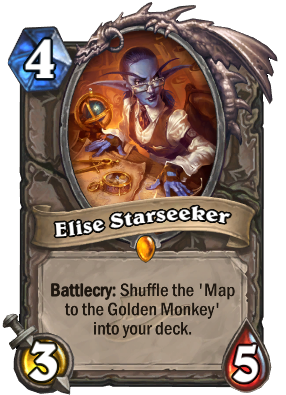 The Explorers give you a spare deck that "they made for a Tournament a year ago but haven't updated since" - even though it's got lots of new LoE cards. Cancer Buffadin works decently well against The Steel Sentinel. Heroic is trickier though, adjusting it to have some more heals and dispels will help. I could very easily see a custom made Hunter deck with a lot of low-cost beasts and multiplying critters working well. 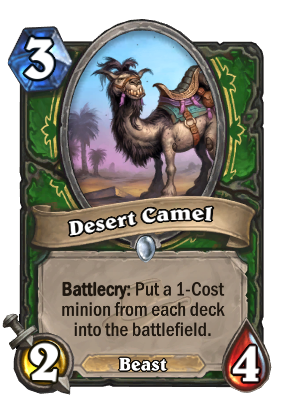 Desert Camel + Injured Kvaldir combo. Can't wait! Maybe we won't have to wait until tomorrow afternoon and we'll get this on EU tonight. This wing seem more elaborate than the previous specially the final boss. I hope I don't get disappointed. 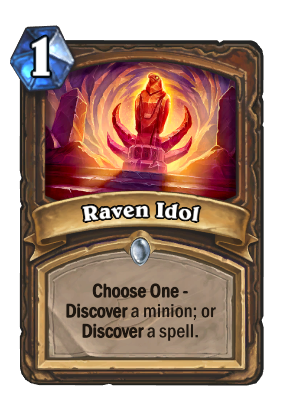 Raven Idol is an interesting card I guess. It is a RNG based card yet it can be useful. 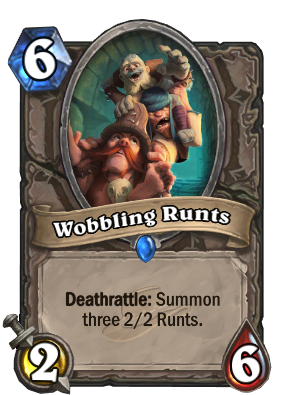 I wonder if we are going to see this card on Token Druids. 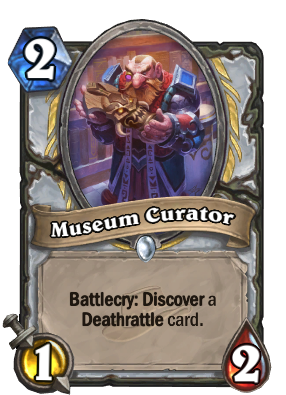 May be it is going to bring Gadgetzan Auctioneer back?